Start heating dutch oven over coals to about 300 degrees for Frying. Stir oil, garlic, broth and nectar to a boil. Add the bell pepper, corn, beans, and chilies to the dutch oven. Stir until the liquid returns to a boil. Remove dutch oven from heat and stir in all spices and couscous. Cover with lid and let stand for 10 minutes. Coarsely chop some cilantro leaves, not stems. Mix to fluff up couscous and serve with chopped cilantro sprinkled on top. 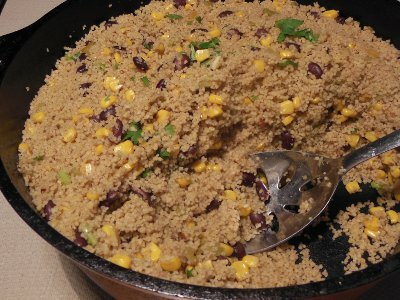 Let me know how you enjoyed your Jamaican Couscous!